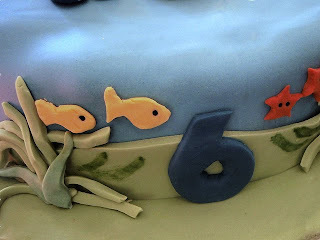 Argy recently turned 6 and, as is our custom, placed a request for a special birthday cake. I held my breath. The Octonauts, he declared. Whew. 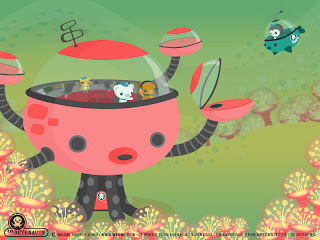 The Octonauts - a crew of storybook (and now animated) animals who roam the ocean and have adventures - are pretty cute. They would be fun to do. But then Argy added the qualifier: the Octopod please, mum. If you are unfamiliar with the Octonauts, may I present the four-armed, glass-domed under-water vehicle they call the Octopod. Dear reader, is this a shape that really says cake to you? After negotiations about the design (where its rumoured I resorted to half-truths about not having the right food colouring to make the Octopod) we decided upon some of the Octonaut characters and an underwater scene. ... and came up with this instead. Its not quite the Octopod, but Argy was very happy with it. NB. If you're the gambling type, I'm opening the books and taking bets on possible 7th birthday cake requests: a watch mechanism; the planetary system; a Harrier jump jet; and Brighton Pavilion. ...and I bet you were so relieved that Argy was happy. Fabulous job, Liesl! That's not a cake, that's a work of art! Who got to eat the characters that you so lovingly sculpted? do you know how much I've missed you!?! God, I hope that Argy and my wee girl don't decide to get married (and request a cake....). It appears that they not only share a love of the Octonauts, but also of challenging design requests. I think you triumphed with the cake solution. Those creatures look incredible! I much prefer the underwater scene, the octopod reminds me of how I felt recently after eating a huge vanilla slice with ice cream and whipped cream on the side. Delicious! Though would have been better with one of your octonauts on top. That is one rad cake! I can't wait for monday when they return to ABC 2 with the big Peso race - it will stop the nagging in this house! That cake looks wonderful, I don't know how Argy had the heart to cut into it! It's all about negotiation (to get a better deal for mum) Fantastic cake! wow this is so impressive! i would have found it hard to cut such a work of art. 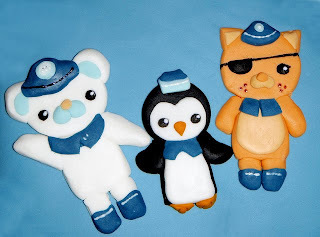 We're big fans of the Octonauts here! Much anticipation abounds for tomorrow's debut of the Octonauts and the Great Penguin Race on ABC tomorrow morning. Fabulous, fabulous cake... what a lucky boy. FanTAStic cake. I wouldn't be surprised at all if you actually cold have brought off doing the Octopod because you have some Mad Cake Skillz. Wow - that is a reeeeeaaally cool cake! 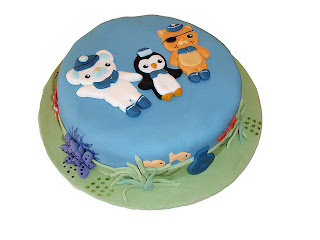 Our little one loves the Octonauts too, but she just had a ladybird cake for hers a couple of weeks ago! I've never heard of the Octonauts but there is a penguin so it must be good. Blog Arranged Marriages by similar awkward creation requests. Yeah, that works! 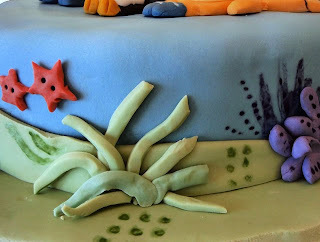 What an amazing cake - you are so very very clever! OMG. This is not a cake - it's a work of art, Liesl. I bet Argy was over the moon! Brighton Pavillion, but not the Taj Majal? The Octnauts cake looks brilliant! Wow, it may not be the octopod but it sure is fabulous! This is really looking so beautiful.... Great Work! Keep it up. Those creatures look incredible! Cool cake! maybe he'll ask you to recreate Crystal Palace? Awesome! 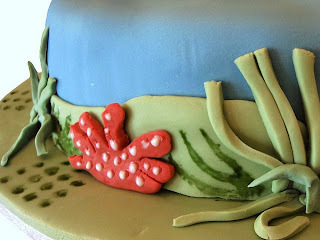 As the design and look of this cake are really looking with full of impression. I am totally surprised to see this elegant contented cake. It's really looking one of creative artwork. Thanks for sharing.